This year marks the 60th anniversary of Tibetan uprising. On March 10, 1959, a revolt erupted in Tibet’s capital Lhasa, which finally resulted in the flight of the 14th and current Dalai Lama. In the northern Indian town of Dharamshala, the Dalai Lama, the most important spiritual leader for many Tibetan Buddhists, established a Tibetan government-in-exile that still exists today. Recently, the Dalai Lama accepted an exclusive interview with Reuters, where he once again talked about the issue of his potential successor — the most sensitive topic for the Tibetan government-in-exile as well as for the Chinese government. 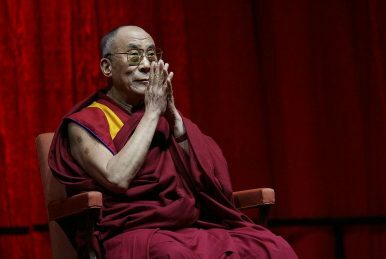 During the interview, the 83-year-old Dalai Lama told Reuters that it was possible that once he dies, his reincarnation could be found in India, where he has lived in exile for 60 years. “China considers Dalai Lama’s reincarnation as something very important. They have more concern about the next Dalai Lama than me,” said the Dalai Lama. “In future, in case you see two Dalai Lamas come, one from here, in free country, one chosen by Chinese, then nobody will trust, nobody will respect [the one chosen by China]. So that’s an additional problem for the Chinese! It’s possible, it can happen,” he added. The institution of reincarnation of the Dalai Lama has been in existence for several hundred years. The 14th Dalai Lama himself was found and recognized following religious rituals and historical conventions and his enthronement was approved by the then central government. Therefore reincarnation of living Buddhas including the Dalai Lama must comply with Chinese laws and regulations and follow religious rituals and historical conventions. This article apparently targets against the Dalai Lama’s future reincarnation. It has long been assumed that China’s government will seek to handpick the next Dalai Lama, to ensure Tibet’s top Buddhist leader is friendly to Beijing in the future.